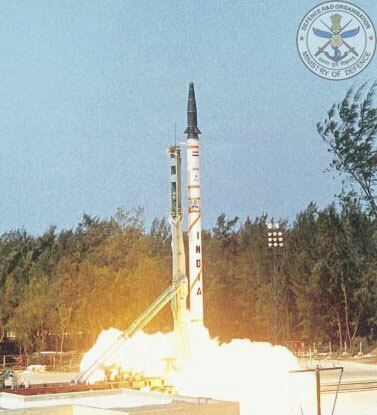 India is all set to test its 2,000-km-plus Agni-II missile from the Wheeler Island off Orissa coast again on Monday. Significantly, the nuclear-capable missile will be launched for the first time during night in a major step towards making it fully operational in the Strategic Forces Command (SFC). Defence officials said Agni-II’s ‘user training trial’ was likely to be conducted around 8pm on Monday to give the necessary confidence to the armed forces that the two-stage, solid-fuelled missile can be fired whenever required. Incidentally, DRDO is also working on MIRV (multiple independently targetable re-entry vehicles) technology for the Agni series of ballistic missiles. An ‘MIRVed’ missile can carry a bunch of nuclear warheads in a single payload, each of which can hit different targets along separate trajectories. Such missiles can conceivably overwhelm even robust ballistic missile defences of an enemy. MIRV technology is considered important for a country like India, which has a clear no first-use nuclear doctrine but warns that nuclear retaliation to an enemy first-strike will be ‘massive and designed to inflict unacceptable damage’. Pakistan, with the active help of China and North Korea, has surged ahead of India in the missile arena. Some US nuclear experts recently estimated that Pakistan has more nuclear warheads than India. As per their estimates, it has 70-90 warheads compared to 60-80 of India. China is in a different league altogether, brandishing as it does ICBMs (intercontinental ballistic missiles) like Dong Feng-31A (11,200-km range) and SLBMs (submarine-launched ballistic missiles) like JL-2 (7,200-km range). But coming back to the Agni-II test, it will take place only if all the pre-launch final checks go smoothly as planned on Monday. The missile, which is around 20-metre tall and weighs 17 tonnes, was earlier to be tested on November 6 but it was called off at the last moment due to some glitches. Even Agni-II’s last test on May 19 was not fully successful. Consequently, the only ballistic missiles which can be said to be “100% operational” at present are the short-range Prithvi missile (150-350 km) and, to a certain extent, the 700-km-range Agni-I. The fourth test of 3,500-km Agni-III, which will give India the strategic capability to hit targets deep inside China once it becomes fully operational by around 2012, will take place early next year. India’s most ambitious strategic missile Agni-V will be ready for its first test only in end-2010 or early-2011. With a proposed range of 5,000-km, Agni-V will have near ICBM capabilities (strike range in excess of 5,500-km) and give India’s “dissuasive deterrence posture” against China some much-needed muscle.